The following article was contributed by Zach DeChant. Zach is the Senior Assistant Director of Strength Training at Texas Christian University and the good news is… Zach will be speaking at Pitch-a-Palooza this December alongside the game’s most sought after minds. Be sure to check it out. I believe strongly in the benefits of speed training for all athletes, including pitchers. Compliments strength and power development. Sprinting falls directly in line with our overall philosophy of training pitchers to be fast, powerful, and explosive. “Train fast to be fast” is how I approach speed work. 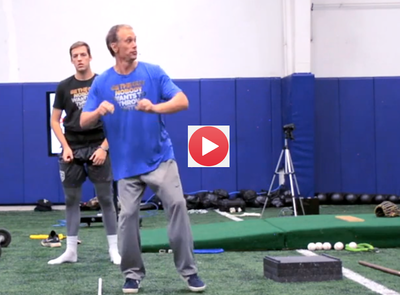 It plays a large significance in the overall development of all athletes and can especially benefit pitchers for several reasons that I feel are extremely significant. The central nervous system is the driver of all movement, especially those requiring speed, power, and explosiveness. Throwing a baseball is a single explosive event based around creating power with long rests between throws. Pitching is nothing more than individual CNS intensive repeat efforts. We want to develop the nervous system to the highest level possible with every training mean available. Training for speed results in inter-muscular and intramuscular coordination, rate coding, and in the end developing a more efficient neuromuscular system. A bigger motor creates higher outputs in power, strength, reactivity, explosiveness etc. Build the motor as big as possible with the best training means available. I know no better method for developing the nervous system than sprint training. Strength and speed development often go hand in hand. Get a kid stronger and they get faster. But does strength training build speed only or can speed training actually build strength? We know in lower level as well as many intermediate level athletes developing strength carries over into faster running speeds. The late Charlie Francis was a huge advocate of speed actually enhancing strength. He often referred to the crossover effect of strength training. Every muscle that is strengthened leads to every other muscle strengthening. All strength work leads to a crossover effect in the human body. This is actually the CNS in play again here. Just as strength work allows for more power on the track, more power on the track allows for larger gains in the weight room. They feed on each other. Again, being that the CNS is the driver of both, higher outputs in one assists the other. The end result of developing the nervous system means higher outputs on the field of play no matter what the sport. The force-velocity curve shows the inverse relationship that force and velocity have. When force is high as in maximal strength work, velocity is low. When velocity is highest force is low. Training on each end of the spectrum assists in raising the entire line along the curve and benefiting all strengths. We can get the most bang for our buck by training at high speeds, as well as using heavy strength movements. The posterior chain is heavily taxed when training for speed, or acceleration. The glutes, hamstrings, calves are all huge contributors. There is little else that develops the backside as athletically as sprinting. The stiffness that is required during foot touchdown can’t be matched with weight room activities. Sprinting can actually be injury preventative for the hamstrings as well. Game speeds for pitchers aren’t slow when bouncing off the mound to field a bunt. If you train slow when it’s time to turn it on under the lights, injuries occur. Sprinting at high speeds develops reactivity which is the ability of a muscle to contract, relax, and contract again. This again ties back into the CNS, as well as the stretch shortening cycle and the ability to be powerful. Sprinting itself nothing more than a highly coordinated movement of equal and opposites involving every muscle in the body at high velocities. Don’t overlook sprinting as a means of developing coordination, especially in younger athletes. Speed training is a general training mean for our pitchers. It’s not necessarily specific to anything but neither is the weight room for that matter. What is it specific to is creating a larger motor, and a more athletic athlete. Building a bigger motor with sprint training can assist athleticism in all endeavors on and off the field. Zach has been in place since 2008 at TCU as the Senior Assistant Director of Strength and Conditioning. He oversees the development of Baseball, as well as the quarterback development for Football. Alongside these priorities he also handles the development and implementation of the Strength and Conditioning Internship Program. During baseball off-seasons, Coach Dechant trains a group of 30+ current MLB / MiLB Frogs. The pro Frogs spend 4 months back on campus training for the upcoming season. Previous experience to TCU has included two seasons with the Los Angeles Angels of Anaheim, two years at Missouri State University, as well as time spent with the University of Washington as an intern.Zach graduated with a Bachelor’s Degree in Health and Wellness from Missouri State University in 2003. He is certified through the CSCCa, NSCA, FMS-1 and the USAW.